If you’ve been craving to see more of the Ford Mustang Cobra Jet, then look no further than the ADRL Supercar Showdown. The series, launched this year, has been dominated by Ford so far, with a Cobra Jet in the winners circle for every event. Of course, the ADRL knows that not everyone can make it out to see the events live, so they’ve been gracious enough to upload some footage for all Mustang enthusiasts to see. Their latest video is from the Ohio Drags VI at Summit Motorsports Park in Norwalk and features the Cobra Jet doing what it does best – burnouts, wheelies and recording fast times. How fast, you ask? In the 1/8th mile, which the series uses, Chris Holbrook ran a blistering time of 5.67 seconds at 121.88 mph to take the overall win. You can check out that run and more for yourself in the video below. 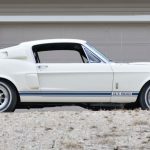 This entry was written by by MustangsDaily (Mustangs Daily) and posted here on Monday, October 8th, 2012 at 10:09 pm and is filed under adrl, adrl supercar showdown, Cobra Jet, Ford Mustang Cobra Jet, Motorsports, mustang cobra jet, Videos. This article was not written by us, rather gathered using RSS feeds listed here. We take no credit for this article. You can leave a response, or trackback from your own site.